This tutorial provides you with a foundation for working with Adobe InDesign tools. It is the first lesson in the Adobe InDesign CS6 Digital Classroom book. For more Adobe InDesign training options, visit AGI’s InDesign classes. This lesson gets you started with InDesign CS6, covering essential skills necessary for working efficiently with InDesign documents. It provides a high-level overview of key concepts associated with creating layouts using InDesign. You’ll work with an existing document to understand how to navigate, place graphics, and add formatting to text, creating a finished newsletter that can be printed or distributed as a digital document. In this lesson, you will work with several files from the id01lessons folder. These files are included with the InDesign CS6 Digital Classroom book. If you haven’t purchased this book, you can still follow along using your own files. This lesson provides an overview of InDesign concepts. After completing this lesson, you’ll then examine individual capabilities and features in more details in each of the remaining lessons. It may be helpful to view this lesson as a broad survey, providing you with a general understanding of the InDesign landscape, while the remaining lessons provide much more detail about specific InDesign capabilities. You’ll use InDesign’s tools for creating or modifying everything that appears in your documents, including text, images, and multimedia elements for digital documents. 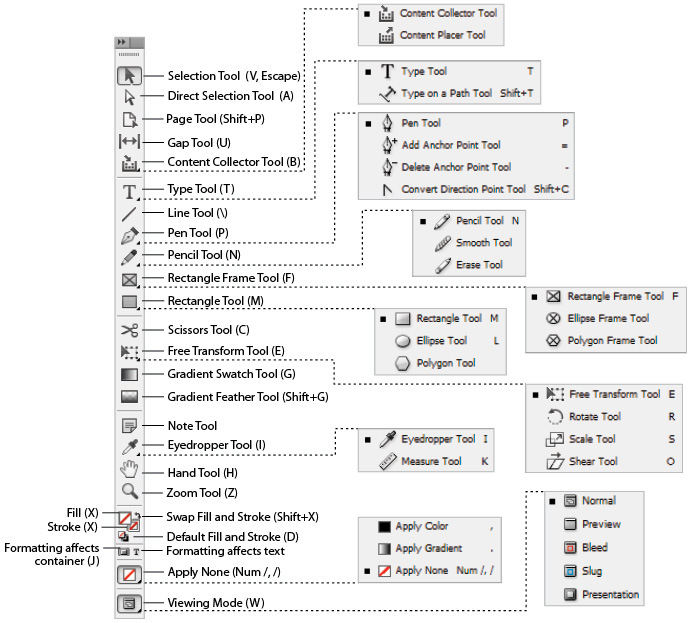 You’ll also use InDesign’s tools for navigating around the document. All tools are found in the Tools panel, located along the left side of your screen. Many tools displayed in the tools panel have related tools that provide additional functionality, and you can select these related tools by clicking and holding the tool that is displayed in the tools panel. You can identify the tools with additional functionality by the small arrow in the lower-right corner. You can also right-click (Windows) or Ctrl-click (Mac OS) on a tool to access any related tools. If you place your cursor over any tool in the Tools panel without clicking, a tooltip appears, displaying the tool’s name and a keyboard shortcut in parentheses. You can use the keyboard shortcut to access a tool from your keyboard, instead of clicking on it with your mouse. 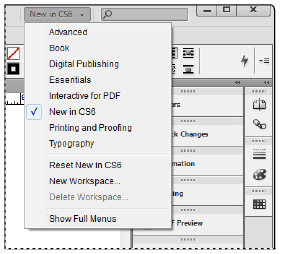 Use the InDesign CS6 Tools panel to create objects, make selections, and modify objects and pages. InDesign documents are displayed in the center of the work area, while panels that let you control objects or perform specific tasks are displayed along the right side of the workspace in the panel docking area. InDesign uses many panels, and many are critical for editing and design work you perform. InDesign includes various workspaces that provide easy access to the panels and tools you’ll use for specific tasks. Let’s take a closer look at the InDesign workspace, including the document window and panels. 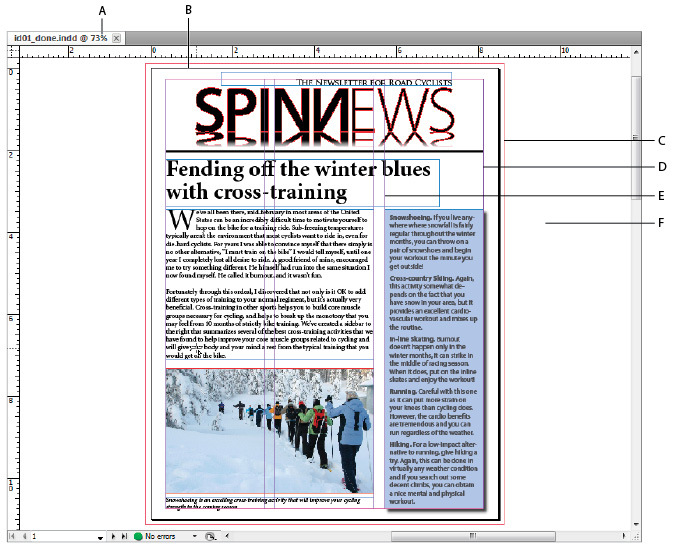 InDesign pages are displayed within a black border. Anything positioned within this area appears when the page is finished. The area outside of the black border is referred to as the pasteboard. Anything that is placed completely outside this black border on the pasteboard is generally not visible when the final document is distributed. You can use the pasteboard to temporarily hold elements while designing your project. You can move design elements such as images from the pasteboard to the page, trying different layout variations. The pasteboard can also be useful for placing notes to colleagues—or even yourself—regarding the project. To get a better understanding of the InDesign workspace, you’ll open up the completed project, reset the workspace, and look at the work area. 1 Choose File > Open. In the Open a File dialog box, navigate to the id01lessons folder and select the id01_done.indd file. Click Open. 2 Choose Window > Workspace > Typography. Panels containing controls that help you work with type are now displayed. You can also use the dedicated Workspace switcher to switch to a specific workspace. The Workspace switcher is located in the Application bar above the Control panel. The Workspace switcher displays the name of the current workspace and can also be used to change between workspaces or to reset the current workspace. The selected workspace determines which panels display and which menu items are available. The number of available panels and menu choices is based upon the selected workspace. The workspace switcher makes it easy to display specific panels and menus depending upon your needs. 3 Choose Window > Workspace > Reset Typography to reset the InDesign panels to their default positions for the Typography workspace. This ensures that your panels are in position, making them easier to locate during this lesson. A. The document window. B. The page border (black lines). C. Bleed guides. D. Margin guides. E. Column guides. F. The pasteboard. Ruler guides are the other type of guide you may want to add to your document layout. Ruler guides are created manually by dragging them from the rulers onto the page. Both ruler guides and margin guides are useful, but they can also be distracting when you want to see the elements of your page design. In this case, you can hide the guides. 1 Choose View > Grids & Guides > Hide Guides, or use the keyboard shortcut Ctrl+; (Windows) or Command+; (Mac OS), to hide all the guides in the open document. 2 Choose View > Grids & Guides > Show Guides, or use the keyboard shortcut Ctrl+; (Windows) or Command+; (Mac OS), to show all the guides in the open document. 3 You can show or hide guides by toggling back and forth using these commands. Another type of guide is the liquid guide, which is used to help adjust the layout of an InDesign page when it is displayed as a digital document. Liquid Guides are a more advanced topic and are covered in the Creating Digital Documents lesson of the InDesign CS6 Digital Classroom book. You can use viewing modes to hide guides and other items that will not display when the final document is printed or distributed. This provides a fast-and-easy way to preview your document. You can even turn your document into a presentation. The viewing modes option lets you choose whether all content and guides display on your monitor, or whether InDesign displays only content that is positioned on the page and will print. Here you will explore the various viewing modes. 1 At the bottom of the Tools panel, click and hold the Mode button (), and choose Preview from the available modes. Notice that the entire pasteboard appears gray and all elements located on the pasteboard are hidden. The borders do not display around any items on the page if they are not selected. Click the display mode button at the bottom of the Tools panel to change how a page is displayed using InDesign. 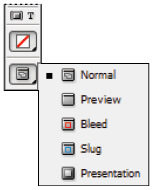 2 Click and hold the Mode button again and choose Bleed from the menu. This shows the allowable bleed area that was specified when the document was created. Bleed is an area outside of the page that is intentionally used by designers so that any inaccuracies in the cutting, trimming, and binding process do not create a visible white space along the edge of an object that is intended to print all the way to the edge of a document. This mode is useful when you need to make sure that all the elements on your page extend to a specific bleed value. In this document, the bleed is set to 1/8 inch, which is a standard bleed value in the printing industry. 3 Click and hold the Mode button again and choose Presentation from the menu. This mode presents your document on a black background with no distracting interface elements. This is great for viewing your document or showing it to a client. When in this mode, you can navigate through the pages of your document by using the up and down or left- and right-arrow keys on your keyboard. To exit Presentation mode, simply press the Escape key on your keyboard. 4 Click and hold the Mode button again and choose Normal. You can also use the shortcut key W on your keyboard to switch between Preview and Normal modes, and Shift+W to activate Presentation mode, or you can use the Screen Mode button in the Application bar. Keep in mind that keyboard shortcuts do not work if you are using the Type tool and working with text inside a text frame.